The idea that corporate culture in Russia appeared only 20 years ago, after the collapse of the Soviet Union, is demonstrably false. The corporate culture of various bureaucratic institutions of the tsarist era, for example, fully described in the works of Dostoevsky and Chekhov, are familiar to many Russians. In the 20th century, Russia generated a new type of corporate culture based on Soviet "offices" and political party organizations in enterprises. The period of market reform in Russia in the 1990s witnessed the emergence of a “bandit concept" of corporate management, but since the early 2000s, the young Russian nation has rushed to implement Western-style corporate governance. Corporate culture in Russia today has not shed any of the features it accumulated in the past; it is an amalgamation of styles from all the eras mentioned above. 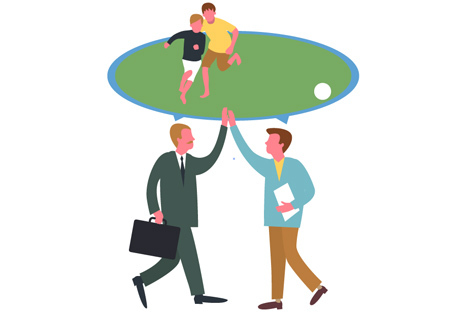 Many believe that corporate culture in Russia, if it actually exists, is poorly developed – for comparison people tend to bring up examples of corporate culture in major Western companies. However, corporate culture in Russia does in fact exist, but it has some rather peculiar features. Foreign companies that come into the Russian market are astounded by the inability to instill in Russian employees a love of the company, its brand and its ideology. Under no circumstances will they learn the code and hymn of the company. According to the results of opinion polls conducted by Headhunter.ru, Russia's leading recruitment website, fewer than 15 percent of Russians pay attention to a company’s policy and only 6 percent are guided by ideological considerations when choosing their workplace. The most important thing is to be paid well, but it is even better if there is an old acquaintance working there, a childhood friend, a sister’s cousin or a former classmate. The problem is that, over the last few years, Russians have been taught not to believe in anything except people. Commitment to an ideal never led to anything good - but the right friends and acquaintances and strong human relationships? Yes. People in Russia, after moving from one company to another, tend to transfer their whole department with them – they just drag each other along. After finding jobs, they try install relatives, friends and former colleagues beside them. A new generation of young Russians has now grown up and they are starting to get jobs and start their own businesses. These are people who were still children in the 90s and only vaguely remember the period. They are brand-savvy, believe that they can change the world, discuss new ideas, make up their own, and launch startups with global ambitions. But they are still only at the beginning of their career path: They are in the process of forming their own culture, but it has not yet gained widespread currency. Perhaps they will be able to start believing in new ideals. Companies such as ABBYY, Kaspersky, Yandex, VKontakte and others, which are developing Western type corporate cultures, are currently exceptions to the rule.